The archives presents the research state known to us. 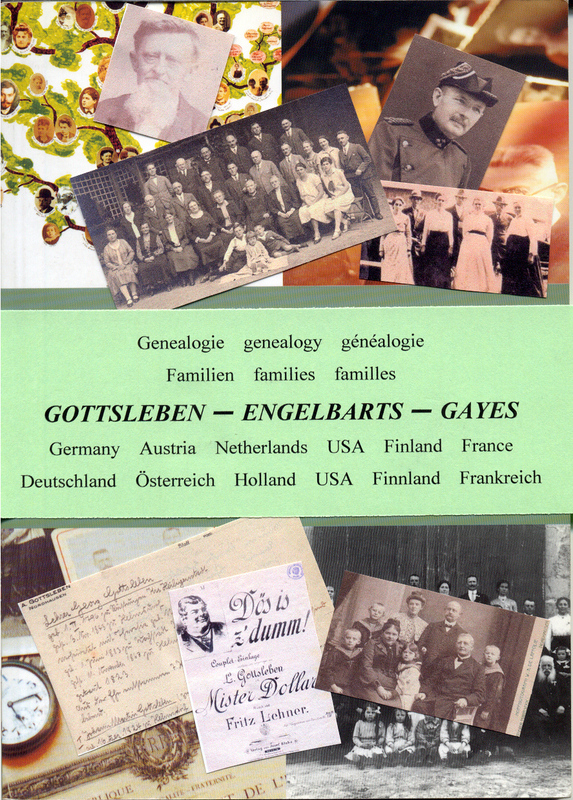 Have a look at the genealogy of the families Gott(e)sleben/Gottleben (Germany/United States/Finland), Engelbarts (Germany/Netherlands), Voß/Voss (Germany) and Gayes (France). Maybe we have common ancestors, can exchange data and close the still big gaps in the genealogy. The Family Research Project Gott(e)sleben/Gottleben/Gayes/Engelbarts/Voß/Voss lives on the fact that personal data are gathered and published. Only such a comprehensive genealogy can originate over time and in collaboration with many genealogists. Nevertheless, we must respect the personal rights of persons still living. Therefore, we have decided to publish no event dates and location for persons from birth year 1915. We hope to dispel any reservations and to win family members to contribute to our project. Parts of our family history were published by Klaus Gottsleben in Wikipedia. Takeover of data please with reference. Any commercial use of this web-site is prohibited.